Video cameras have come a long way since its inception. Today, the buzz is all about handheld action cameras that can shoot videos regardless of where you are. These can be carried around easily, making it more accessible to everyone. Popular among these action cameras are the ones that come from GoPro. The company has been heavily involved in the industry and has offered amazing cameras that can shoot 4K videos. An essential component for a GoPro is something known as a gimbal. This is a motorized contraption that pairs with your camera or phone with Bluetooth and can keep the video stable even if you’re taking an action shot i.e. a video of moving objects. We’re going to talk about five of the best gimbal video stabilizers available for the GoPro. You might be aware of some of these gimbals, but we’ve made sure to include some new members on this list as well. So let’s have a look. This accessory comes right from GoPro, which is why it features on top of our list. This has been designed to work with every GoPro body mounts and it even comes with the Karma Harness for the HERO6 Black or the HERO5 Black. This gimbal also comes with controls on board to help you operate the camera without your phone or another paired device. It’s not too large and can be handled easily. The main purpose of this gimbal is to make sure your videos don’t show shake and other markers of movement. It keeps your videos stable, while also letting you take some beautiful videos. The gimbal can also be attached onto your body, which is helpful when you’re shooting video during a hike or any other adventure activity. Thanks to the onboard controls, you can even stop/start recording directly on the gimbal. The gimbal, on a full charge, can help your GoPro and itself run for about 105 minutes, which is pretty designed for a battery operated offering. Just like GoPro products, this gimbal won’t come cheap. It’s currently listed on Amazon for $299.99. 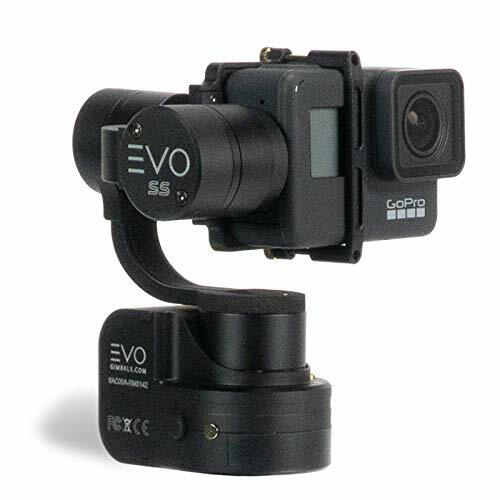 EVO makes exciting gimbals for the GoPro and other action cameras. The GP-PRO comes with a 3-axis motor, allowing you to take shake free videos in any environment. Another key feature of this gimbal is that it supports a wide range of action cameras, including the GoPro Hero5, Hero4, Hero 3, Hero3+ and a lot more. 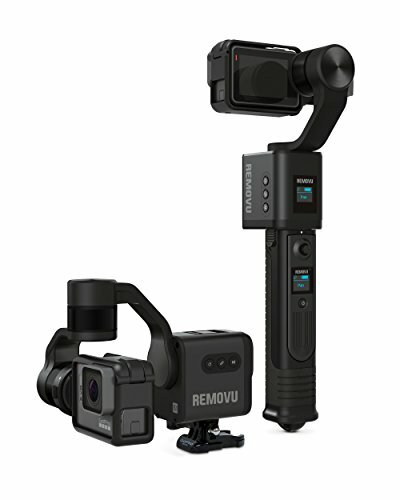 This gimbal comes with a charging cable by default, allowing your GoPro to be charged whilst taking the videos. It’s also possible to connect to an external monitor using the 3.5mm AV output jack on the gimbal. This, however, is only compatible with GoPro Hero3 and Hero4 models right now. The EVO GP-PRO doesn’t require a lengthy setup and is ready to use as soon as you unbox it. The manufacturer mentions that the gimbal can run for up to 5 hours on a full charge, which is pretty spectacular considering what the competitors are offering right now. This gimbal is also reasonably priced with Amazon asking for $199 for this particular product. 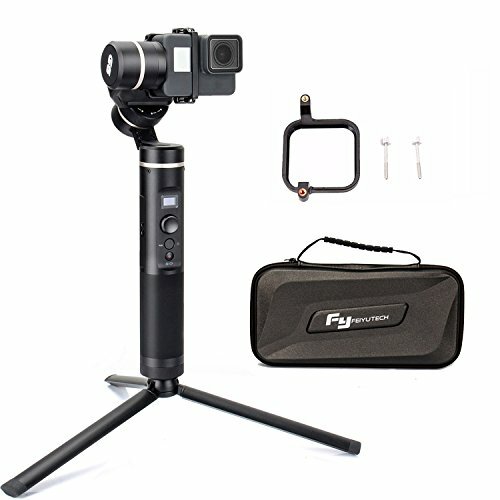 Customer reviews are pretty favorable for this product as well, so you can buy this particular gimbal with absolute confidence. 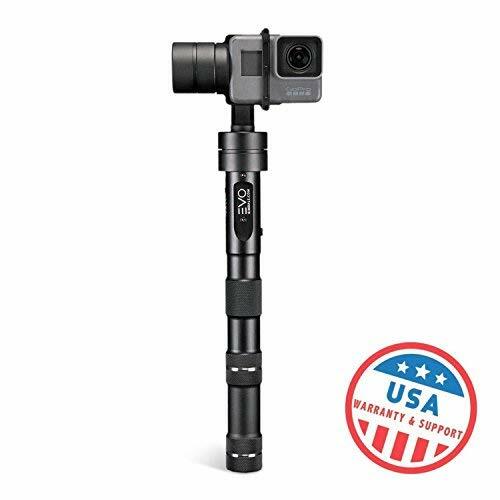 This gimbal is compatible with the GoPro Hero 6, Hero 5, Hero 4, Hero 3 as well as the Hero 3+, so you’re set as long as you have any of the recent GoPro models. The Feiyu G6 also comes with an app of its own if you find that GoPro isn’t just doing it for you. The app can control the GoPro Hero 6 and Hero 5, allowing you to shoot videos as you would on the GoPro app. When your camera is connected to a Wi-Fi network, the G6 can pair itself over Bluetooth on your smartphone. The app is incredibly handy as it can offer you suggestions on shooting modes. This gimbal pretty much makes the GoPro app obsolete, although we highly recommend you to keep GoPro’s app on your smartphone. You can manually set the rotation axis depending on the kind of videos you want to be taking with the camera. This is a pretty effective GoPro gimbal if you’re in the market for something like this. It is currently priced at $239, which doesn’t make it cheap, but is still worth the price. 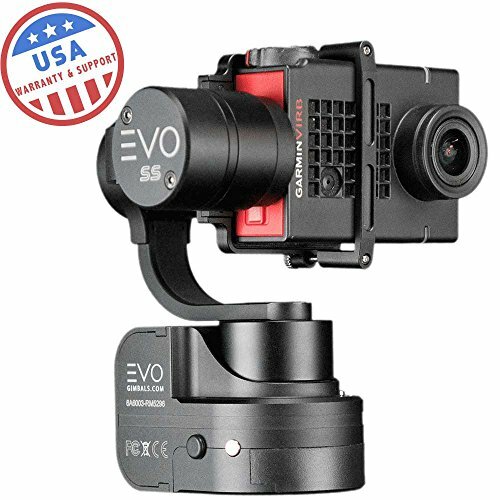 The second EVO gimbal on our list should tell you how popular the manufacturer is out there. The EVO SS comes with a 3-axis motor and can keep your videos shake free. The company mentions that the battery life of your GoPro can be extended by up to 2 times using this particular gimbal, although this only applies to Hero3 and Hero4 models. This is thanks to the built-in charger provided with the EVO SS. The lithium ion batteries on board can run for up to 4-5 hours as per the company’s estimation. This is a plug-and-play device, allowing you to start shooting videos as soon as you unbox it from the retail packaging. The reason EVO is such a popular name in the industry is because they make amazing gimbals for the GoPro. This is a pretty exciting product and can be yours for just $249 on Amazon. 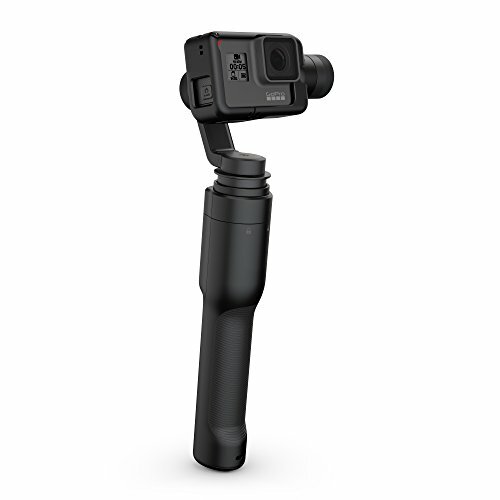 This particular gimbal works with the HERO6, HERO5 Black, HERO5 Session, and HERO Session, leaving out some of the popular GoPro offerings out there. But if you own any of these GoPro devices, the Removu S1 is definitely a decent choice. This is a handheld mountable gimbal, which is pretty rare in the industry. It comes with a wireless remote control allowing you to control the gimbal’s features as well as the rotation. The gimbal has three modes – Pan, Follow, and Lock, allowing you to get amazing videos even in the toughest environments. It’s a pretty great alternative to some of the options we’ve mentioned above. Amazon is currently offering the Removu S1 for $249. Be sure to check it out.